In this post, you will get a quick glimpse of how Telstra successfully rolled out DevOps across the entire organization (170 teams). The details have been taken from this post. 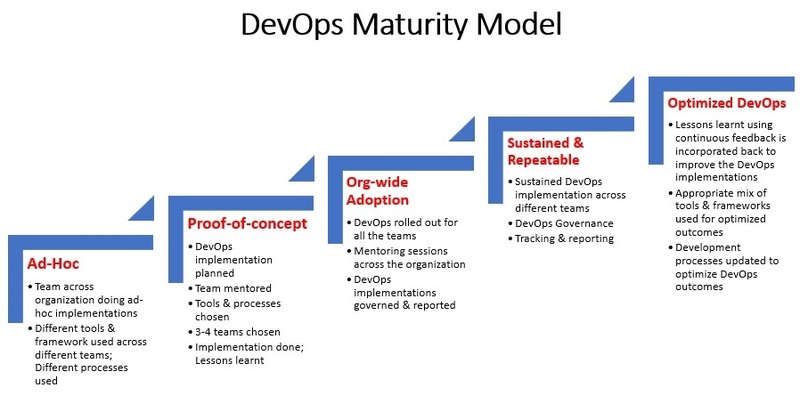 You could use the details given below to lay out the maturity model for DevOps implementation in your organization. Teams do not seem to have a proper understanding of what is DevOps, benefits of DevOps etc. In this post, you learned about a sample DevOps maturity model which looks to have been implemented at Telstra. The DevOps implementation faces several challenges such as doing POC, training & mentoring, convincing executive management, making sustained & repeatable DevOps. Most importantly, there must be put a governance framework to monitor/track ongoing DevOps implementation across the organization to achieve sustainability and repeatability.